The accumulation of amyloid beta (Aβ) oligomers or fibrils is thought to be one of the main causes of synaptic and neuron loss, believed to underlie cognitive dysfunction in Alzheimer’s disease (AD). Neuron loss has rarely been documented in amyloid precursor protein (APP) transgenic mouse models. We investigated whether two APP mouse models characterized by different folding states of amyloid showed different neuronal densities using an accurate method of cell counting. We examined total cell and neuronal populations in Swedish/Indiana APP mutant mice (TgCRND8) with severe Aβ pathology that includes fibrils, plaques, and oligomers, and Dutch APP mutant mice with only Aβ oligomer pathology. Using the isotropic fractionator, we found no differences from control mice in regional total cell populations in either TgCRND8 or Dutch mice. However, there were 31.8% fewer hippocampal neurons in TgCRND8 compared to controls, while no such changes were observed in Dutch mice. We show that the isotropic fractionator is a convenient method for estimating neuronal content in milligram quantities of brain tissue and represents a useful tool to assess cell loss efficiently in transgenic models with different types of neuropathology. Our data support the hypothesis that TgCRND8 mice with a spectrum of Aβ plaque, fibril, and oligomer pathology exhibit neuronal loss whereas Dutch mice with only oligomers, showed no evidence for neuronal loss. This suggests that the combination of plaques, fibrils, and oligomers causes more damage to mouse hippocampal neurons than Aβ oligomers alone. Alzheimer’s disease (AD) is a progressive neurodegenerative disorder characterized by the presence of extracellular amyloid beta (Aβ) plaques, neurofibrillary tangles, and severe loss of synapses and neurons 1. One of the limitations of AD mouse models has been the absence of cell loss in many of them 234, although systematic head-to-head comparison of neuronal loss in mouse models has been hindered by the fact that high-quality morphometry is not routinely available or achieved. Furthermore, there are a number of non-stereologic approaches, prone to observer biases, which are often employed but fail to produce comparable results, within a laboratory as well as across studies. As a result, reliable quantification of neuronal loss has not been routinely included in the characterization of mouse models. Absence of data on neuronal loss reduces the usefulness in specifying how particular transgenes and interventions impact neuronal integrity. Here, we examined changes in total cell (i.e., neurons and glia) and total neuronal numbers and densities in two mouse models of AD harboring different APP mutations and exhibiting different panoplies of Aβ biophysical phenotypes: the TgCRND8 mouse and the Dutch APP mouse. TgCRND8 mice express the Swedish (K670M/N671L) and Indiana (V717F) APP mutations, and exhibit increases in total production of Aβ and in the Aβ42/Aβ40 ratio, leading to accumulation of intraneuronal Aβ, Aβ amyloid plaques, soluble oligomeric Aβ (oAβ), and insoluble fibrillar Aβ (fAβ) 5. The Dutch mouse expresses the E693Q mutation that favors the production of oAβ over fAβ and accumulates intraneuronal Aβ and oAβ 3(Additional file 1: Table S1; Figure 1). APP/Aβ pathology in the hippocampus of TgCRND8 mutant APP and Dutch mutant APP transgenic mice. Aβ and APP species were visualized using the 6E10 antibody. Extracellular amyloid plaques (asterisk) are evident in (B) TgCRND8 APP transgenic mice (3.5 months old), while (C) Dutch mutant APP (17 months old) exhibit intracellular APP/Aβ-like immunoreactivity (APP/Aβ-LIR; arrow). No APP/Aβ-LIR is seen when 6E10 is used to immunostain brain of a wild type mouse (A). Inset panels represent higher magnification of 6E10 immunoreactivity of plaques in TgCRND8 mutant APP mice and intracellular APP/Aβ-LIR in Dutch mutant APP mice. Scale bars represent 500 μm. Scale bars in insets represent 100 μm. We employed the isotropic fractionator method 6, and quantified cell and neuronal populations in these two different APP mouse lines that we predicted would demonstrate different levels of neuronal integrity. When comparing our total cell numbers to published estimates from wildtype mouse brains, we found that they were comparable to those reported for whole brain using the isotropic fractionator 7, and for specific brain regions such as the cerebellum, as estimated by isotropic fractionator and flow cytometry 8, and the hippocampus as assessed by traditional stereology 9101112(Table 1). When assessing total cell and neuron populations, we found no differences in total and regional brain weights between transgenic mice and their respective littermates. We also did not find any differences in total cell counts or densities between TgCRND8 mutant APP mice and controls (Figure 2A-F). However, we observed significantly fewer (31.8%) hippocampal neurons between TgCRND8 mutant APP mice and their non-transgenic littermates (t(12) = 2.391, p = 0.033; Figure 2H). No significant differences were observed in total neuronal counts or densities in neocortex or cerebellum (Figure 2G, I-L). When we studied Dutch mutant APP mice, we found no significant differences from controls in total cell count, neuronal cell count, cell density, or neuronal density (Figure 2). We did not observe neuronal density changes in the neocortex, perhaps because of region- or even layer-specific vulnerability of select neuronal populations. We did not assess neuron numbers in specific neocortical regions and, as such, any locally restricted loss may have been undetected. We also analyzed mice at only one time point and it is possible that neocortical neuronal loss may appear at later stages. 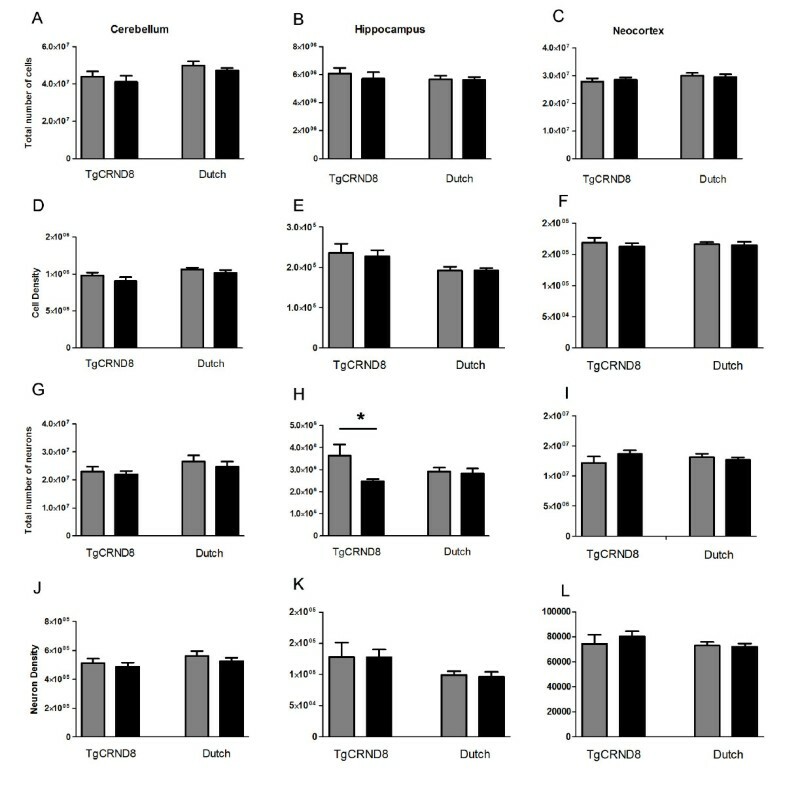 TgCRND8 mutant APP transgenic mice exhibit significantly lower neuronal numbers and densities as compared to Dutch mutant APP transgenic mice. There was a significant difference observed in neuronal numbers in the hippocampus between TgCRND8 mutant APP mice and their control littermates (H). Left column represents TgCRND8 mutant APP mice (black) and their littermate controls (grey) and the right column represents the Dutch mutant APP mice (black) and their littermate controls (grey). Note that the scale of the y-axis changes among the graphs. Values represent mean ± SEM. *p < 0.05. Aberrant accumulation of brain Aβ over decades has been proposed to result in synaptic and neuronal loss associated with the progression of AD (for review see 13). Evidence indicates that accumulation of soluble oAβ relates to cognitive impairment in AD patients 14and AD mouse models 2315. However, the possibility that the severity of neurotoxicity and neuronal loss may be related to levels of Aβ solubility or confirmation (oAβ or fAβ) remains unclear. Using high-resolution 3D reconstructions, intraneuronal accumulation of fAβ has been observed by some investigators who proposed that this fAβ leads to the disruption and degeneration of spines and neurites, and ultimately to neuronal death 16, even though other investigators have reported that oAβ alone is sufficient for behavioral dysfunction 15. Importantly, other studies have demonstrated reduced neuron densities in various lines of APP mice following onset of plaque pathology. These observations were primarily derived from the hippocampus and are similar in magnitude to the loss we report in TgCRND8 mice, albeit using different counting methods (Table 1). Using a stereologic approach, Calhoun et al. (1998) found a ~25% loss of CA1 neurons in TgAPP23 mice, while Schmitz et al. (2004) found a ~30% loss of neurons in the CA1-3 regions in an APP/PS1 double mutant mouse, and Breyhan et al. (2009) found a 33% loss of CA1 pyramidal neurons in APP/PS1 knock-in mice. Our results indicate that, in wildtype mice, estimates derived from the isotropic fractionator are generally comparable to stereologic estimates. 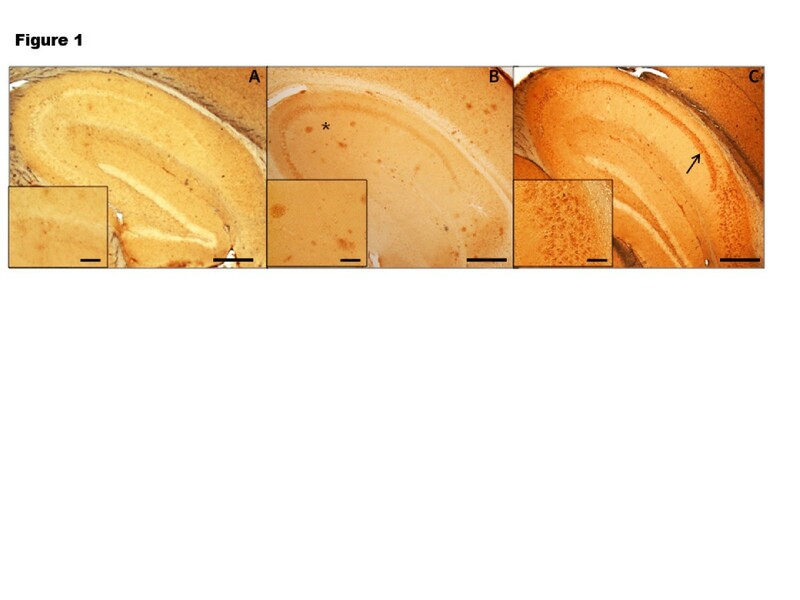 Most importantly, we observed an apparent neuronal loss in TgCRND8 mice that form oAβ, insoluble fAβ, and amyloid plaques, but not in Dutch mice that produce only oAβ. It is evident that both oAβ and fAβ are toxic and implicated in the neurodegeneration process. However, various Aβ species may impair neuronal function via different mechanisms, and clarification of this point merits further investigation. Eight 6-month-old TgCRND8 APPK670N/M671L/V717F mice and seven wildtype littermates, as well as nine 18-month-old Dutch APPE639Q mice and eight of their littermates were used in this study. 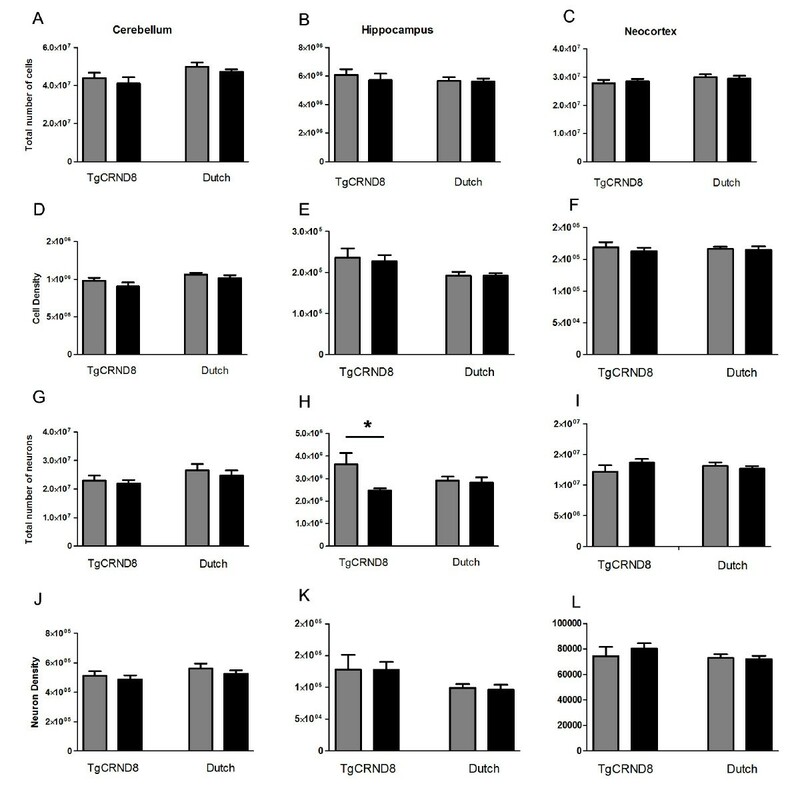 These ages were chosen as previous studies demonstrated clear behavioral impairments and amyloid deposition in the TgCRND8 mice and intracellular accumulation in the Dutch mice at these time points 35. All mice used in the current study were group-housed, given ad libitum access to food and water, and housed under a 12-hour light/dark cycle. All animal procedures were conducted in accordance with the National Institute of Health Guidelines for the Care and Use of Experimental Animals and were approved by the Institutional Animal Care and Use Committee of the Icahn School of Medicine at Mount Sinai. Animals were perfused as previously described 17. Brains were removed from the skull and postfixed in 4% PFA at 4°C. Brains were weighed, cut into half, and further dissected into three regions, cerebellum, hippocampus, and neocortex and weighed. Results were multiplied by 2 to obtain estimates of cell numbers for the entire brain. In addition, brains were immunostained with the anti-amyloid monoclonal antibody 6E10 (Covance) as described in 15. The isotropic fractionator is a fast and reliable technique for determining total cell and neuronal counts and cell densities in the brain. The procedure involves processing of highly anisotropic brain structures into homogeneous isotropic suspensions of cell nuclei that can be easily quantified 6. Because the estimates of cell counts are obtained separately from the determination of brain volume, the two measurements can be used in comparative studies of brain-volume variation (i.e., comparing across species or between different mouse lines 6). Briefly, postfixed samples were mechanically dissociated and homogenized in a solution of 40 mM sodium citrate and 1% Triton X-100 as previously described 6. The homogenates were collected and the homogenizer washed at least twice to collect any residual cells. To visualize nuclei and obtain total cell counts, 1 μl of 4’,6-diamidino-2-phenylindole (Sigma) was added to the cell suspension (volumes according to brain region; 10 ml for cerebellum and neocortex, 3 ml for hippocampus. The volume for each brain region was optimized so that at least 500 nuclei could be counted) To determine total neuron counts, 1 ml of each cell suspension was removed, washed with PBS, and centrifuged for 10 minutes at 4000 x g. Cells were then incubated in anti-NeuN antibody (1:200; Millipore) for 2 hours followed by incubation in a secondary anti-mouse IgG-Alexa-Fluor 594 for 1.5 hours (1:200; Millipore). Cells were then counted with a hemocytometer using a 20X/0.45 N.A., Plan-Apochromat objective on a Zeiss Axiophot microscope equipped with a motorized stage. All four quadrants in both the upper and lower grids of the hemocytometer were counted and averaged. Total cell numbers and neuronal numbers were calculated by multiplying the number of cells/ml by final volume. Densities were calculated by dividing the number of cells/ml by the mass of brain region. All statistical analyses were performed using SPSS v19.0. Independent samples t-tests were used for comparison of TgCRND8 mutant APP or Dutch mutant APP mice to their respective littermates. Levene's test for homogeneity of variance was used for inclusion in parametric tests (p > 0.05). Significance for t-tests are reported with a p value < 0.05 using two-tailed tests with an α level of 0.05. Values represent mean ± SEM. This work was supported by NIH grants P50 AG05138 (DLD, SG, PRH), P01 AG10491 (SG), and F31 AG039890 (HB). Support was also provided by the Canadian Institutes of Health Research (MOP-115056, PEF and PHH), Alberta Heritage Foundation for Medical Research (DW), and the Wellcome Trust, Medical Research Council, Howard Hughes Medical Institute, and Alzheimer Society of Ontario (PHH). We would like to thank the members of the Ehrlich, Gandy, and Hof laboratories for help and discussion, and Dr Suzana Herculano-Houzel (Federal University of Rio de Janeiro) for introducing us to the isotropic fractionator. We would like to acknowledge Dr Camilla Butti (Icahn School of Medicine at Mount Sinai) for her help with optimizing the isotropic fractionator protocol. HB, JWS, PRH, and DLD all contributed to the writing of the manuscript. HB and DLD performed the isotropic fractionator and analyses. SG (with Dr ME Ehrlich, Icahn School of Medicine at Mount Sinai) created the Dutch APP mouse model and DW, PEF, and PHH created the TgCRND8 APP mouse model. SG and PRH supervised the project and edited the manuscript. All authors have read and approved the manuscript.